Two really exciting new lenses for reduced-sensor-size cameras have been introduced within the past couple of weeks. Canon's EF-S 17-55mm ƒ/2.8 IS USM (right) is just exactly the lens a number of XT/350 and 20D shooters have been waiting for, at least since Nikon introduced its extremely popular 17-55mm ƒ/2.8 two and a half years ago. 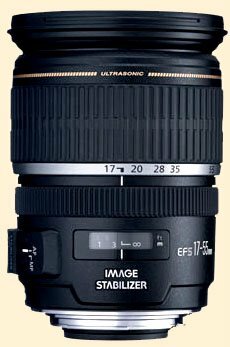 For guys like me who shoot portraits and some product shots but otherwise don't have a lot of need for telephotos, the range of these lenses is ideal, and the speed and constant aperture strike a great compromise with the lenses' size and weight. That Canon's offering includes its extremely useful (and, for me, must-have) Image Stabilization (IS) capability is a plus that vaults it ahead of the established Nikon offering. 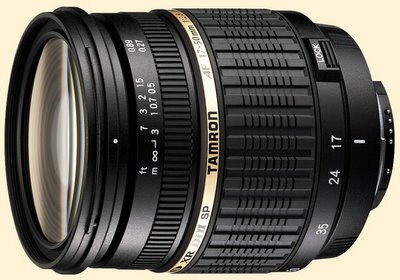 Tamron's new SP AF17-50mm ƒ/2.8 XR Di II LD Aspherical [IF] (top) is a poor(er) man's version of the Nikon lens. I've been shooting with Tamron's 28-75mm lens for some time now (actually the K-M branded version), and even as a zoomaphobic lens snob I have to say I've been very impressed with it. It's a truly good lens, even a great one. I can home in on the optical flaws of lenses like a truffle-snuffling pig in the woods, but even I have a hard time making that Tamron look bad. Nikon and Canon shooters won't get IS with the Tamron lens. But therein lies a tale. Ideal though the Canon lens may be, its anticipated sale price of $1150 is a possible Achilles' heel. Now, I've always hated it when camera reviewers and product news blips tell us how to feel about prices. Let's face it: how any of us see prices is up to us as individuals. For some people, $1150 for a camera lens is out of the question; for others, it's no more of a concern than paying for a meal; and a lot of others fall somewhere in between. But for those DSLR buyers looking for a bargain and willing to take a flier on what is admittedly a second-tier brand with some (albeit slight) uncertainties attached to its future, the Konica-Minolta 5D body at $570 and 7D body at $935 are hundreds of dollars less than their Canon XT/350 and 20D counterparts—yet both have Anti-Shake (AS, K-M's version of IS) built into the bodies. The price of the new Tamron lens has not been announced or listed yet as far as I know, but it is highly likely to be somewhere between 1/3rd and 1/2 of the price of the Canon EF-S—for virtually the same functionality if you use it on one of the K-Ms. Might be something to think about. In any event, assuming the performance of Canon's 17-55mm can match its Nikon competition, and Tamron's 17-50mm is in the same league with its own 28-75mm, then both these lenses will usefully expand consumers' options for this highly useful lens specification. You have a very good point about the Konica-Minolta. I'll indeed think about it. I don't get why neither Canon nor Nikon have yet introduced a body with built in stabilization. Oooh, ooh: How effective would you say the KM stabilization is? Two stops? Oops, I meant "Nikon Coolpix P3".